Lighting Designs that Work Best in any Remodel! No one needs to be an interior designer or decorator to know the importance of indoor lighting. Proper lighting helps maximize the full use of your home. The trend in home design is the multi-purpose use of each room while keeping the GREEN concept intact. When selecting appropriate lighting, look for something that complements the décor without being obtrusive. Indoor lighting should always provide sufficient visibility for every task. More homes are now using natural light as their primary indoor light source. Frankly, this means selecting high-performance lighting for cloudy days or after dark, and that can be a bit more challenging. At TrustBilt of Albuquerque, NM, we offer remodeling design ideas for lighting to help our customers benefit from as much natural light as possible. Rooms that serve as gathering places in your home and that host multifunctional activities such as a media center, conversation cubbies, reading chairs, home art collections, etc., need particular attention. 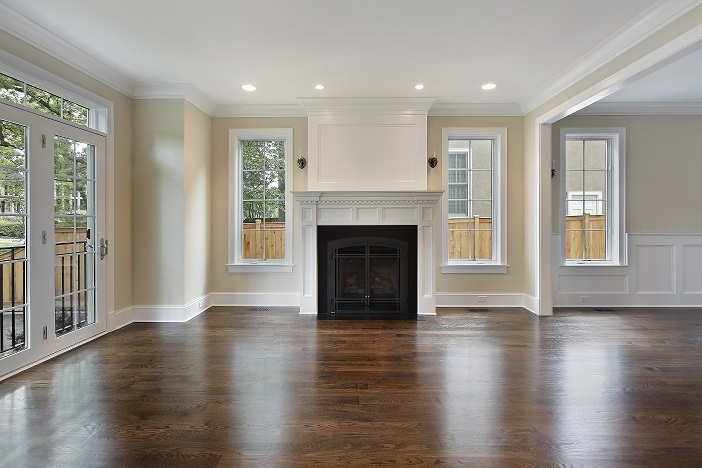 Recessed down-lights are most effective in drawing attention to the fireplace and removing visual clutter. Use a bar of dimmer switches with small lights for portraits, and sculptures that can also be lowered to accommodate a media screen, televisions, and computers. Freestanding lamps prevent glare and are the perfect match for your family bookworm. Illuminate your game tables with a 36- inch pendant lamp hanging above the activity area, making sure you consider efficient headroom. 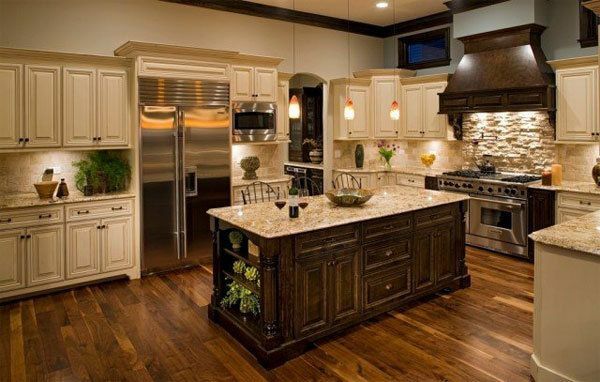 Other than the living room area, the kitchen is the other most important room in your entire house. If your kitchen is a gathering place for family or friends, cooking and just sitting for long chats, your lighting requirements will be diverse. Under-cabinet lighting should be located in the front part of the cabinet, making it less visible and more efficient. Recessed lighting is a perfect match for over the sink and stove area. It supplies high focused light and yet stays out of the way. For a romantic dinner setting. We also suggest using a pendant dimmer light over your kitchen nook. Regardless of what your lighting needs are, today you have more options than ever before! At TrustBilt of Albuquerque New Mexico, we take pride in offering remodeling services and lighting ideas to all of our customers. Did you know that you can also choose different hues of lighting and use the warm light vs. a bright lighting effect? Whatever you do, remember that in selecting the right lighting for your home, it is important to find something that fits your lifestyle and personality. Have fun! In spite of the fact that the ceiling has a tendency to be out of sight, the right designs on the ceiling can have a vivid effect on the general décor. Designs and hues can be utilized to highlight a focal light, and the additional space frequently functions admirably for most remodeling schemes. At TrustBilt of New Mexico, we recommend you explore your options when it comes to texture, color and design of your ceiling and don’t forget to look up when planning your remodel. There are numerous choices for ceiling beautifications. As opposed to painting the ceiling a smooth white to supplement the dividers, you could embellish the ceilings with beautiful elements that make them stand out gracefully. For example, in the event that you have white dividers, then a diverse flower example will most likely draw the eye, light up the space and make an impression in the room. Ceiling outlines are suitable for a wide exhibit of aesthetic tastes. Considering adding softly-hued vines inching in from the corners to the overhead light in the focal point of the ceiling that offer an interesting effect. Likewise if you incorporate rich, yellow tones that become more immersed toward the focal point of the ceiling, it will cause your ceiling to stand out. A ceiling painted one solid color may not be sufficient. This is especially true when it comes to making your ceiling an eye-catcher. Nonetheless, including a few simple designs– even customary, geometric ones like dabs or rectangles – can add a pleasant visual enhancement to the room. This also gives the room a more open appearance, and offers more area options in which to place lighting. Since the ceiling is not a space that can become too cluttered with decor, any practical design that you like, and that compliments your flooring may be a better fit for the ceiling. Swirls and conventional themes on the ceiling can make for an intriguing vision, particularly orchestrated around the focal lighting. Exposed beams, textures and other elements can change an ordinary ceiling into a eye drawing masterpiece! More often than not, parts of the ceiling that include inclines and dissensions, can give a room an alluring and inviting sense of feel. Wood framing is a lovely change of pace, particularly if the dividers are a solid hue of pigment, and will assist in making the ceiling to emerge. Picking the right hues for lightening is essential, as well. Pick colors that accentuate the lighting in the room so that the carved floral design, wood molding or other creative elements stand out against it. At TrustBilt, we take pride in helping our customers make the right choices for celling design and color. 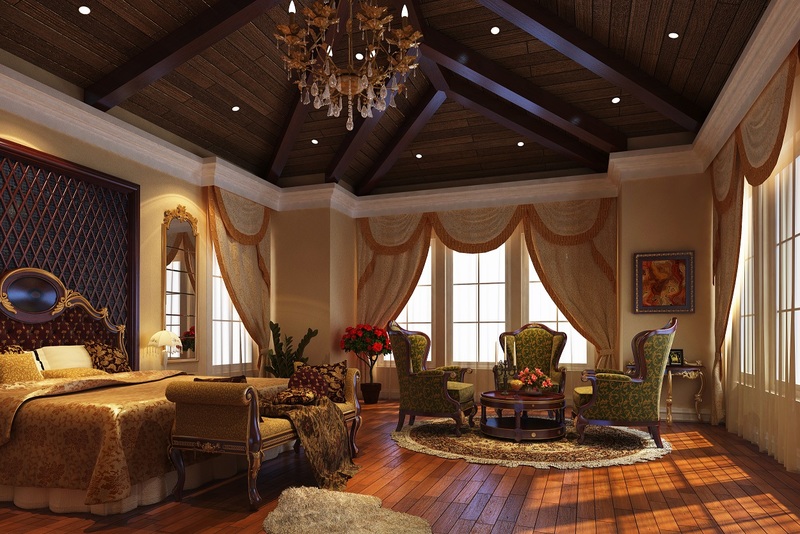 Remember, a remodel often consist of adapting your ceiling to your new floor design elements. Call TrustBilt at 505-688-8194 today for a free estimate. We offer remodeling services throughout New Mexico, including Santa Fe and Albuquerque, NM areas. To be honest with you, most of us never think of the desired results when it comes to remodeling except our present need for improving an outdated design. As we age, our needs become different. If you plan on staying in your home throughout retirement, you will need to be more proactive in making sure that you consider the age factor when remodeling. At TrustBilt of Albuquerque, NM, we have allowed many retirees to stay in their current homes with affordable updates and renovations that meet the needs of every age group. Let’s face it—most people never think about age or health as a priority when remodeling, but they should. Statistics says that up to forty percent of Boomers will remodel their home in the future. Most remodeling ideas are approached with updating in mind, especially in kitchen and bath areas. 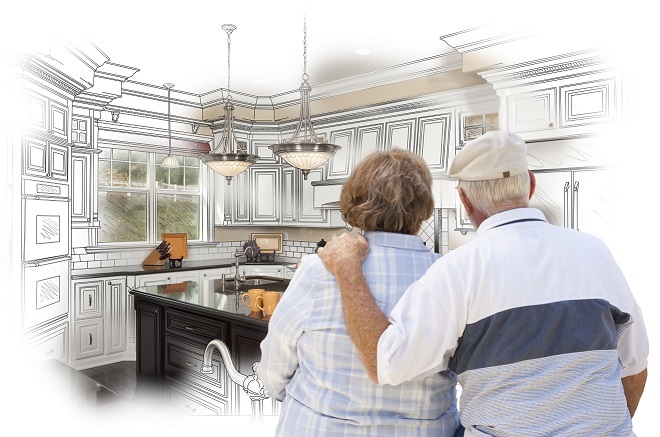 Would your current remodel meet your needs as you age or encounter any health issues? The best way to approach a remodel is with a universal design that meets all ages. A universal or livable design will not only benefit you in the present, but for years to come. No one plans on getting ill or not being able to do things as they age, but life happens. There are several design elements to take into consideration when you are embarking on an update or complete remodeling job. Lighting is probably one of the most crucial aspects to consider. When we age, lighting seems to be a greater need for us whether we are brushing our teeth, cooking or reading. Lighting can be an affordable way to update your home, but keep in mind that the “older eyes” need readily accessible lighting for almost every task. Other elements of design to look out for would be adding pullout drawers in base cabinets, leveling thresholds between rooms, and installing handles that are easier to hold on to instead of knobs. Other implementations such as countertop heights should be considered during a remodel. All of these can be easily implemented to fit into your home, making sure that when you age, your home doesn’t outgrow your basic needs of accessibility. Walk-in showers work best for an aging population but make sure the threshold is insignificant or obsolete, as it can lead to a tripping hazard. The use of a single-lever faucet also helps adults adapt to aging, as well as grab bars in both the tub and shower. Handheld shower hoses work best when they can be adjusted to height. Also, one should consider raised toilets when remodeling a bath. None of these elements takes away from contemporary design, and allow an aging population to stay in their home when they retire. At TrustBilt of ABQ, NM, we strive to meet the needs of all of our customers and offer custom designs that enable an aging population the ability to stay in their homes as long as they want. If you need a new renovation or update that will meet your needs now, and in the future, call us for a FREE ESTIMATE at (505) 688-8194 today. We offer remodeling and new addition construction services throughout New Mexico, including Albuquerque and Santé Fe, New Mexico areas.